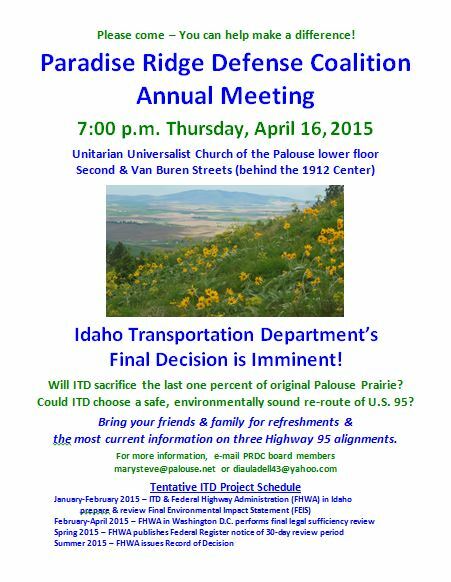 Will the Idaho Transportation Department (ITD) sacrifice the last one percent of original Palouse Prairie? Could ITD choose a safe, environmentally sound re-route of U.S. Highway 95 south of Moscow? ITD and the Federal Highway Administration could issue the final U.S. 95 Thorncreek Road to Moscow Project Environmental Impact Statement, a 30-day review period, and a Record of Decision in summer and fall 2015 [1, 2]. With this final decision and its announcement imminent, you can help make a difference! 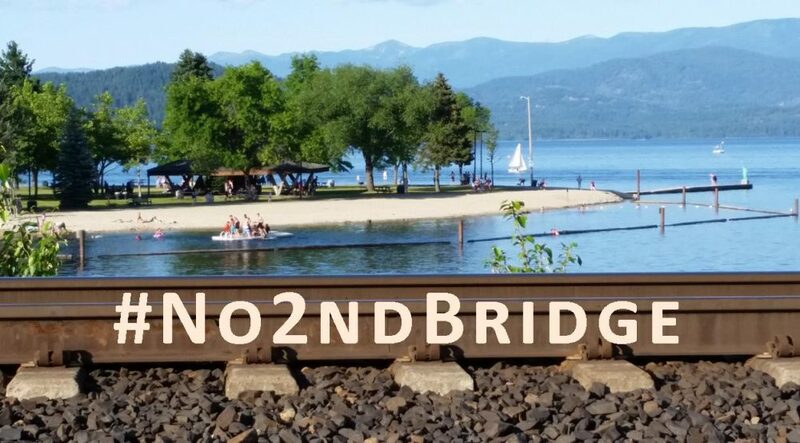 As one of five organizational members of the Paradise Ridge Defense Coalition (PRDC), Wild Idaho Rising Tide joins PRDC in inviting you to bring your friends and family and participate in the first PRDC Annual Meeting at 7 pm on Thursday, April 16 [3-5]. Among refreshments and concerned citizens gathered around exhibit tables and assembled for brief talks by PRDC board members, you will receive printed and mapped information and learn the most current updates on three Highway 95 realignments proposed by ITD. Please circulate the attached event flyer, come to the Unitarian Universalist Church of the Palouse lower floor at Second and Van Buren streets (behind the 1912 Center in Moscow), and sign-up as a supporting member of PRDC for as little as $5. For further event and issue information or if you cannot attend, please respond with your questions, suggestions, and/or intentions to become a PRDC member, by e-mailing PRDC board members Mary Ullrich at marysteve@palouse.net and/or Diana Armstrong at diauladell43@yahoo.com, or by mailing your donation to the enclosed address. Your PRDC membership can greatly assist in supporting an environmentally responsible decision on the Highway 95 realignment south of Moscow. We hope to see you at this important meeting during a crucial time in the long process of determining a reasonable re-routing of U.S. Highway 95.